We eliminate all intermediaries saving more than 50% of your investment compared with traditional cost. We evaluate and control all websites which hosts your campaign. With Rtb Europe you can buy display ads at a considerably lower cost by taking part at real time auctions through impression-by-impression’s exchange platforms. Fill in the form based on your referential target without any obligation. We will send you a mail with the available impressions number and the parameters which will allow you to estimate the saving that you can reach buying profiled display traffic with RTB Europe. N.B. Just some of customer profiling examples are listed. If you have special request send a mail to newbusiness@rtbeurope.com and you will receive our feedback within 24 hours. Wir glauben, dass Echtzeit Bieten ist die ideale Wahl für einen erfolgreichen Display-Werbung von mit soziodemografischen Daten unserer exklusiven Technologie und spezifische Targeting mit dem Fokus auf Benutzer Umsetzung. 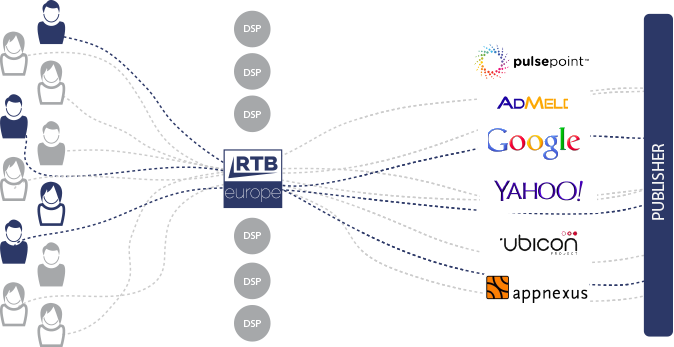 Già da due anni crediamo fortemente nel Real Time Bidding e il mercato risponde in modo esaltante. Siamo una vera opportunità sia per le grandi agenzie e grandi aziende sia per le piccole e medie aziende. Will Programmatic Ad Planning Finally Become More Art Than Science?